Since 2011, North Korea has conducted 98 ballistic missile tests, which have resulted in more capable missiles, larger payloads, longer ranges and presumably increased reliability. During the same period, they conducted four underground nuclear weapons tests  , the most recent on September 3. On July 4 and July 28, 2017, North Korea tested for the first time, an intercontinental-range ballistic missile (ICBM), capable of reaching most of the USA . Expert analysis suggests that the North has the capability to arm ballistic missiles with nuclear warheads and has a baseline nuclear arsenal estimated at around 20 to 25 nuclear warheads with yields in the 15-25 kiloton range . The September 3 nuclear test was likely a thermonuclear device with estimated yields between 108 and 250 kilotons , suggesting that North Korea’s nuclear arsenal could eventually be upgraded to consist of larger yield thermonuclear weapons. In addition, the United States and its allies, in response to North Korea’s missile deployments and continued testing, have looked to bolster their defenses. The Terminal High Altitude Air Defense (THAAD) system has been deployed in South Korea . Japan has selected the Aegis Ashore ABM system . The United States has also tested the Ground-Based Midcourse Defense (GMD) anti-ballistic missile system (ABM) against an ICBM package and is increasing the number of GMDs deployed to 44 by the end of 2017 . If the status quo is unacceptable and diplomacy has been ineffective, then at what point do military responses become probable? The tension between North Korea, its neighbors and the United States are now extremely high, antagonized further by bombastic exchanges between the US and DPRK during the United Nations General Assembly meetings and continued tweets from Trump. History is replete with “rational actors” grossly miscalculating, especially in crisis situations. It is possible that another North Korean nuclear test—especially if detonated in air or under water—an ICBM test, or a missile test that has the payload impact area too close to US bases in Guam for example, might see Washington react with force. This could include such options as attempting to shoot down the test missiles or possibly attacking North Korea’s missile testing, nuclear related sites, missile deployment areas or the Kim Regime itself. The North Korean leadership might perceive such an attack as an effort to remove the Kim family from power and, as a result, could retaliate with nuclear weapons as a last gasp reaction before annihilation. Therefore, it is worth reviewing the consequences if the “unthinkable” happened. Let us assume that North Korea has 25 operational nuclear weapons and that when under attack, it decides to launch its entire arsenal against both Seoul and Tokyo. The warhead yield ranges from 15 to 250 kilotons (current and possible future capabilities) and are timed for airburst at optimal altitude. 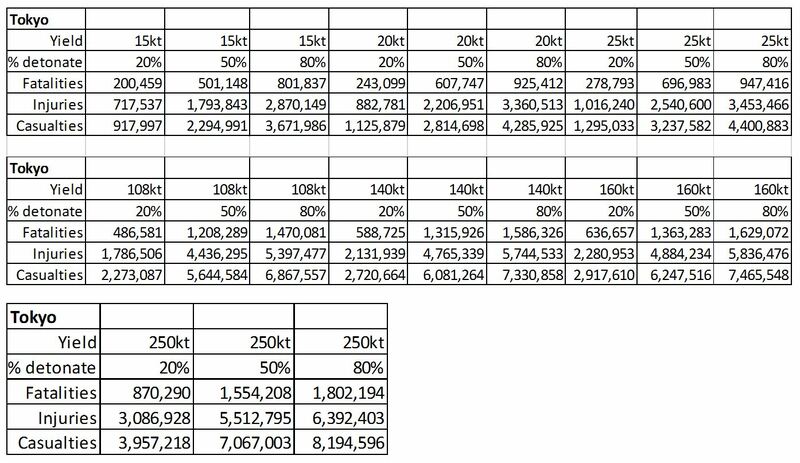 Based on these assumptions, seven scenarios were run, one for each of the seven different warhead yields. There are dozens of variables in calculating the potential effects of nuclear detonations on population centers. One can run countless simulations with many combinations of these variables with a wide range of results . For simplification purposes, the calculations in this simulation are based on traditional population vulnerability due to blast overpressure . The blast areas for the seven weapon yields were calculated using the Nuclear Bomb Effects Computer . The population density at the center of both Seoul and Tokyo is significantly higher. For example, the population density of Seoul Special City is 17,002/km2 , the population density of Tokyo’s Special Wards is 14,950/km2 . Moreover, the population density levels of these special areas can significantly increase during the work week. The following maps show the various blast overpressure areas from the 250 kt detonations. 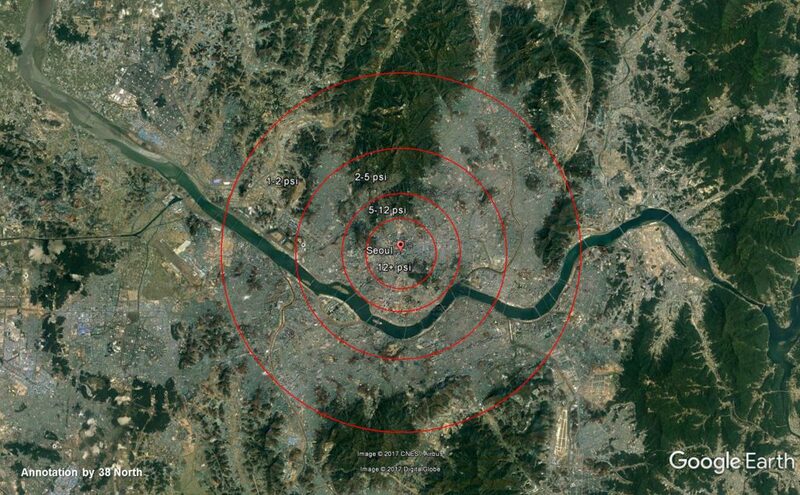 Seoul showing the four blast areas from a 250 kt airbust detonation – 12+ psi, 5-12 psi, 2-5 psi, 1-2 psi. 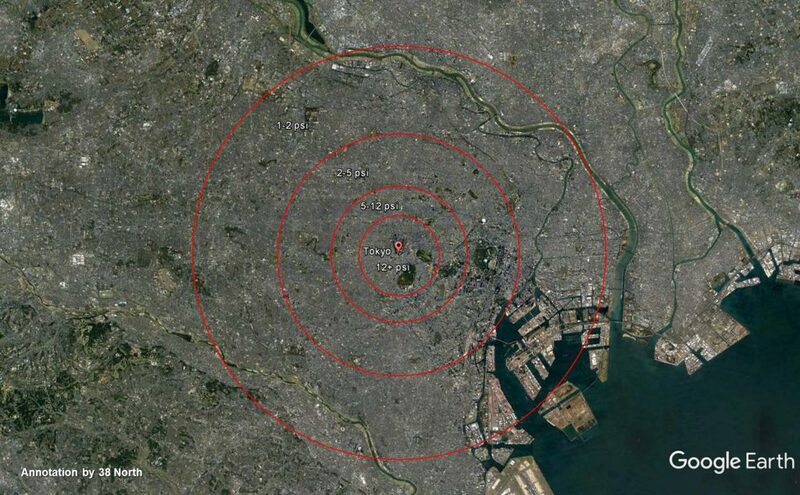 Tokyo showing the four blast areas from a 250 kt airburst detonation – 12+ psi, 5-12 psi, 2-5 psi, 1-2 psi. Naturally, no missile system is 100 percent reliable. The US Minuteman III ICBM, the most tested missile in its arsenal, is listed as having a test reliability of nearly 100 percent . However, as with all weapon systems, its operational reliability is probably less. Moreover, South Korea has deployed one THAAD battery to help protect against a North Korean missile attack and Japan is in the process of acquiring the Aegis Ashore ABM system. Therefore, not all 25 North Korean nuclear missile warheads will detonate on their targets. Three levels of probability of detonation were used in calculating casualties: 20, 50 and 80 percent. 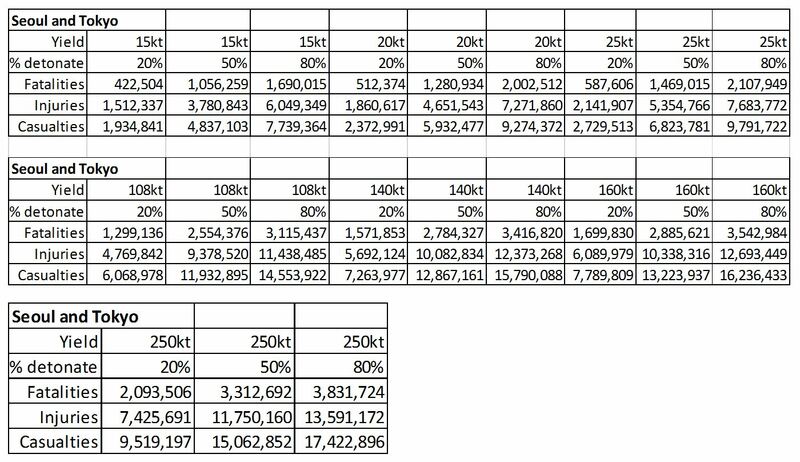 The following graphs show the results of these calculations. The data tables for these graphs can be found in the reference section . These casualty numbers are estimates based on narrow assumptions. Figure 3. 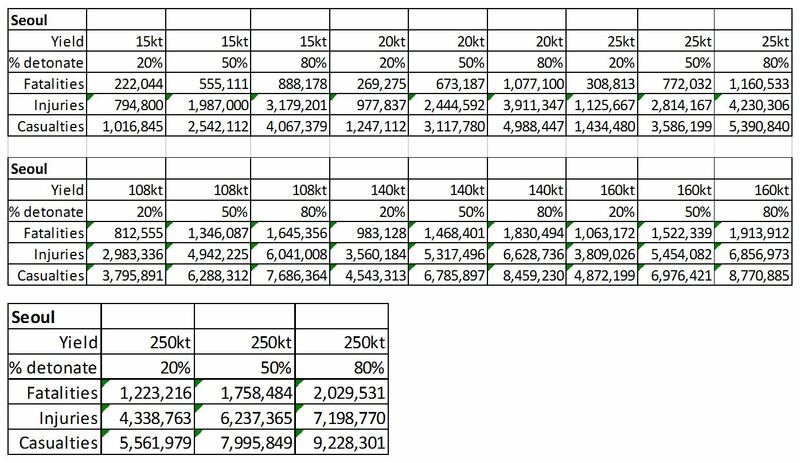 Casualty estimates for Seoul at varied yields and probabilities. Figure 4. 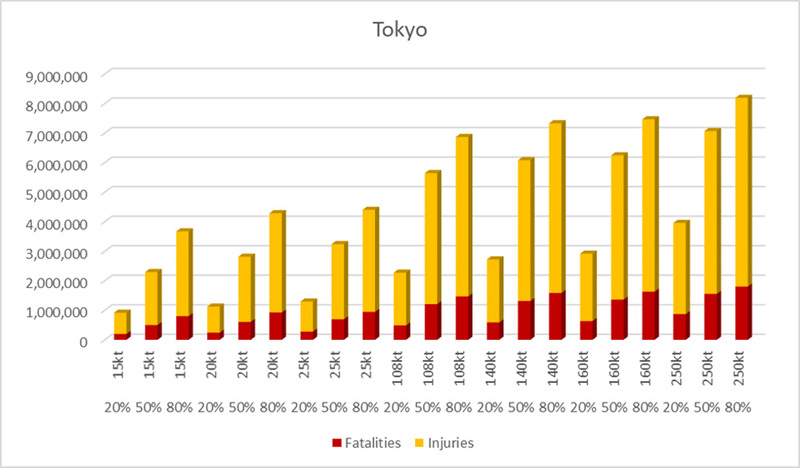 Casualty estimates for Tokyo at varied yields and detonation rates. Figure 5. 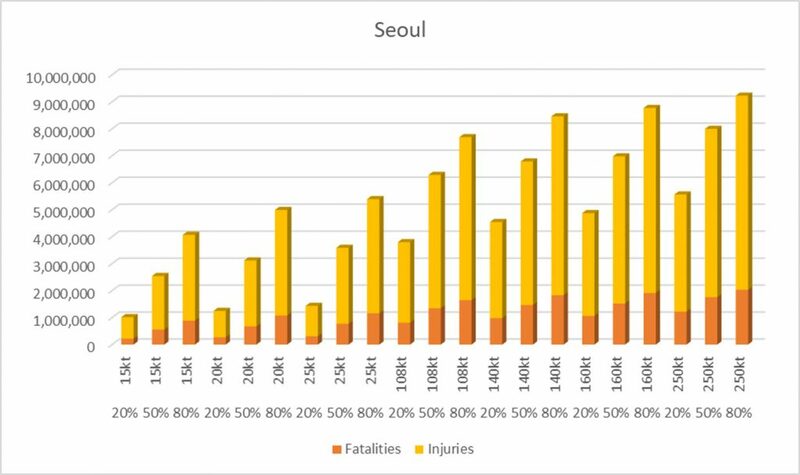 Combined casualty estimates for Seoul and Tokyo at varied yields and probabilities. During the 1950-1953 Korean War, South Korea’s civilian casualties were probably on the order of 373,599 fatalities and 229,625 injured, with 387,744 abducted or missing . Japan is believed to have suffered 500,000-800,000 civilian deaths during World War II . The population densities for both Seoul and Tokyo are far higher today than they were during the 1940s and 1950s. Multiple nuclear weapon detonations on both Seoul and Tokyo based on the current North Korea yield estimates could result in anywhere from 400,000 to 2 million deaths. With possible thermonuclear yields with the same number of weapons, the number of deaths could range between 1.3 and 3.8 million. Missile Threat, CSIS Missile Defense Project, https://missilethreat.csis.org/country/dprk/; Anna Fifield and Dan Lamothe, North Korea fires another missile over Japan, triggering warnings and condemnation,” The Washington Post, September 15, 2017. Jeffrey Lewis, “Why Is North Korea’s Fifth Nuclear Test Different From Its Other Tests?” The Atlantic, September 10, 2016, https://www.theatlantic.com/international/archive/2016/09/north-korea-fifth-nuclear-test-kim-jong-un-why/499490/. Lianxing Wen’s Geogroup, “North Korea’s 3 September 2017 Nuclear Test Location and Yield: Seismic Results from USTC.” University of Science and Technology of China, Sept 2017, http://seis.ustc.edu.cn/_s223/2017/0904/c10084a191096/page.psp; Ankit Panda, “US Intelligence: North Korea’s Sixth Test Was a 140 Kiloton ‘Advanced Nuclear’ Device,” The Diplomat, September 6, 2017, http://thediplomat.com/2017/09/us-intelligence-north-koreas-sixth-test-was-a-140-kiloton-advanced-nuclear-device/; “Japan and U.S. defense chiefs resolve to add pressure on Pyongyang after it exploded a 160-kiloton bomb.” The Japan Times, September 6, 2017, https://www.japantimes.co.jp/news/2017/09/06/national/politics-diplomacy/japan-u-s-defense-chiefs-resolve-add-pressure-pyongyang-exploded-160-kiloton-bomb/#.WbEmVK8Y46Y. Anne S. Lycke, “The nuclear explosion in North Korea on 3 September 2017: A revised magnitude assessment,” Norstar, September 9, 2017, https://www.norsar.no/press/latest-press-release/archive/the-nuclear-explosion-in-north-korea-on-3-september-2017-a-revised-magnitude-assessment-article1548-984.html. John Schilling, “What Next for North Korea’s ICBM?”38 North, August 1, 2017, https://www.38north.org/2017/08/jschilling0808117/; Young-Keun Chang, “A Paradigm Shift in North Korea’s Ballistic Missile Development?” 38 North, April 25, 2017, https://www.38north.org/2017/04/ychang042517/. Elisabeth Eaves, “North Korean nuclear program can’t be stopped with weapons, says Siegfried Hecker,” The Bulletin of Atomic Scientists, May 15, 2017, http://thebulletin.org/north-korean-nuclear-program-cant-be-stopped-weapons-says-siegfried-hecker10769. “Military and Security Developments Involving The Democratic People’s Republic of Korea – Report to Congress 2015,” U.S. Department of Defense, https://www.defense.gov/Portals/1/Documents/pubs/Military_and_Security_Developments_Involving_the_Democratic_Peoples_Republic_of_Korea_2015.PDF. For examples of sanctions against North Korea see: https://en.wikipedia.org/wiki/Sanctions_against_North_Korea. Choe Sang-Hun, “China Suspends All Coal Imports From North Korea,” The New York Times, February 18, 2017, https://www.nytimes.com/2017/02/18/world/asia/north-korea-china-coal-imports-suspended.html; Simon Denyer and Amanda Erickson, “Beijing warns Pyongyang: You’re on your own if you go after the United States,” The Washington Post, August 11, 2017, https://www.washingtonpost.com/world/china-warns-north-korea-youre-on-your-own-if-you-go-after-the-us/2017/08/11/a01a4396-7e68-11e7-9026-4a0a64977c92_story.html; Catherine Wong and Liu Zhen, “China and Russia unite against North Korean nuclear test,” Southern China Morning Post, September 3, 2017, http://www.scmp.com/news/china/diplomacy-defence/article/2109533/china-condemns-north-korean-nuclear-test. Michael Elleman and Michael Zagurek, “THAAD: What It Can and Can’t Do,” 38 North, March 10, 2016, https://www.38north.org/reports/2016/03/thaad-what-it-can-and-cant-do/. “Japan plans installation of land-based Aegis missile defense system amid North Korea threat,” The Japan Times, Aug 17, 2017, https://www.japantimes.co.jp/news/2017/08/17/national/politics-diplomacy/japan-plans-installation-land-based-aegis-missile-defense-system-amid-north-korea-threats/#.WZYG9a8Y6P4. “Unclassified Statement of Vice Admiral J.D. Syring, USN, Director, Missile Defense Agency, Before the House Armed Service Committee Subcommittee on Strategic Forces,” Thursday, March 19, 2015, https://www.mda.mil/global/documents/pdf/ps_syring_031915_hasc.pdf; “Homeland Missile Defense System Successfully Intercepts ICBM Target, US Missile Defense Agency,” Missile Defense Agency, U.S. Department of Defense, May 30, 2017, https://www.mda.mil/news/17news0003.html. Some of the variables: Yield of weapon, ground burst or air burst detonation; downwind fallout (radiation dosage) from ground burst; weather/wind; population protection factor (shelters/evacuation); terrain; blast/burn/radiation effects; time of day, day of week; traditional or conflagration modeling; etc. Source: The Effects of Nuclear War – Office of Technological Assessment, Congress of the United States, May 1979. Figure 1 – Vulnerability of Population in Various Overpressure Zones, p. 19. Approximate blast areas from 15kt, 20kt, 25kt, 108kt, 140kt, 160kt, and 250kt detonations. Area size was calculated using annulus. Sources: Glasstone/Dolan, “The Effects of Nuclear Weapons,” Nuclear Bomb Effects Computer, 1976. The Nuclear Bomb Effects Computer was derived from, “Nuclear Bomb Effects Computer (including Slide-rule Design and Curve Fits for Weapons Effects)”, E. Royce Fletcher, Ray W. Albright, Robert F.D. Perret, Mary E. Franklin, I. Gerald Bowen, and Clayton S. White, Civil Effects Study CEX-62.2, U.S. Atomic Energy Commission, February 15, 1963. The graphs and equations for computing the effects of nuclear weapons, mostly based on extrapolations from Hiroshima data, have been available in the public domain since the 1960s. “World Urban Areas 13th Annual Edition”, Demographia, April 2017, http://demographia.com/db-worldua.pdf. You can run your own scenarios using Alex Wellerstein’s NUKEMAP, http://nuclearsecrecy.com/nukemap/. Note that the NUKEMAP results will vary from data presented in this paper due to population distribution differences, see: http://nuclearsecrecy.com/nukemap/faq/#casualties. “Minuteman III,” https://missilethreat.csis.org/missile/minuteman-iii/. Missile Reliability = Countdown/Launch + Boost Phase + Separation of warhead(s) from booster or warhead “bus” + Penetration (thru defenses) + Detonation. If a missile has a reliability of 96% for each of these phases its overall reliability would be 82% (.96^5). Also see: Warner R. Schilling and Lynn Etheridge Davis, “All You Ever Wanted To Know About MIRV and ICBM Calculations But Were Not Cleared To Ask,” Journal of Conflict Resolution, Vol 17 Issue 2, 1973. “World War II Casualties,” Wikipedia, https://en.wikipedia.org/wiki/World_War_II_casualties.